In March 2003, at age 78, Mrs. Lorraine Taix McCaslin won eight medals at the Greater New Orleans Senior Olympics including six gold medals in track and field events. One of those gold medals was for a long jump of six feet, four inches – a personal best for four-foot, nine-inch Lorraine. Lorraine may be diminutive, but that doesn’t stop this dynamo from winning track and field events all across the nation. In July 2001, she won the long jump at the state Senior Olympic Games and earned herself a spot in the National Senior Olympic Games, where she placed eighth. Constantly striving to break her own records, Lorraine is living proof that it is possible to get stronger as we age. People are always asking Lorraine what pill she takes that gives her so much energy and strength. After all, on a typical day you might find her cleaning gutters in the morning, washing her car at noon, sweeping her sidewalk in the evening, and exercising at the gym at night! Not to mention that she’s made time to log almost 1,000 volunteer hours at the National D-Day Museum since its opening in June 2000. Well…that kind of vitality doesn’t come from a pill. It comes from a positive, winning attitude that embraces life, seeks challenge and never stops looking forward. Whether she’s running 50 meters, setting a new personal best or working to honor America’s veterans, Lorraine is an exceptional achiever. Her life experience keeps vaulting her to become better and better with age. 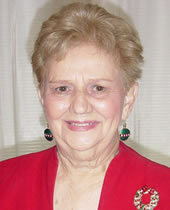 Mrs. Lorraine Taix McCaslin – your final Tenet Choices Champion for 2003.